FDP Locker prevents unauthorized access to your private information by allowing you to password protect the files on your USB flash drive, pen drive, thumb drive, memory stick or any external drive with strong 128 bit encryption. FDP Locker installs right on your flash drive instead of your computer. 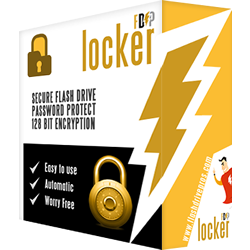 Just click the FDP Locker icon, enter your password, and you can access, encrypt, and decrypt all the files and folders on your flash drive with the click of your mouse.